Our animal friends are exposed to a wide variety of environmental pollutants. They can swallow or lick up toxic household substances, lawn treatments including herbicides and pesticides; they can ingest artificial coloring, flavoring and chemical food preservatives, meat from diseased animals found in pet foods; they must tolerate the stress and strain of vaccines, tick repellent, heartworm chemicals, over-the-counter and prescription pharmaceuticals. The liver is the body’s main detoxifier, one of the most important vital organs. 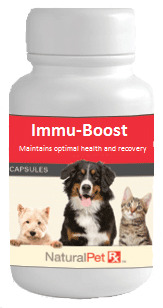 This formula offers support for your pet’s healthy liver function and normal detoxification processes. Based on Minor Bupleurum, Xiao Chai Hu Tang (300 b.c.–300 A.D.), Minor Bupleurum Combination. You may need to take this formula for extended periods. Use with caution with cardiac glycosides and MAO inhibitors. Should be used with caution in those animals with hypertension.